When our road trip to Mexico was coming to its end, we had already decide to spend two nights at the hotel The Palm at Playa, in the Mayan Riviera. The hotel is located in the Playa del Carmen, in a really strategic spot which is on the street right above the beach. The main reason though, why we decided to stay at The Palm la Playa was to finally relax in combination with a twist of having fun of course. What would be more ideal then, than an adult’s only hotel like this that includes all the necessary facilities! Our arrival- after a 4-hour-drive- was accompanied with a wide smile, followed by a quite simple process and a really comprehensive and easy room tour in our-admittedly- huge room apartment which indeed had all someone could ask for. The hotel has a uniquely modern style in combination with the youth vibe that makes you feel relaxed from the very first moment. A uniquely modern style Hotel! We went up to the rooftop of The Palm at la Playa, which, as we were informed, had a bar, pool as well as a restaurant. We were absolutely exhausted and all we wanted was to stay all day in the hotel. And that’s what we actually did, a great afternoon was spent between swimming pool, jacuzzi and cocktails! As you can imagine, the next day did not differ all! Night found us chilling in our king size bed, while gazing at one of the two plasma TVs ,until we fell asleep. The hotel is located in a quite central spot, which is something that explains the fact that you can hear the music coming outside the hotel from some rooms. And for that, they have provided the light sleepers with ear plugs, something we really appreciated since these small details are those that actually count. Of course, in the morning, where else could we be at other than the breakfast area of the hotel? There was not actually a buffet breakfast style, it was more an order kind of menu, where you could choose from a large variety that could cover any taste, something that we actually prefer. We tried the «Palme» eggs and their French Toast which were delicious. All the courses had fresh fruit, various juices and coffee as sides to choose from. The hotel The Palm at Playa, offers a travel concierge as well, named Sandra, who helped us choose what kind of activities we would like to do in the city (we chose to visit Xplor park). Sandra’s amazing vibe and her great services were the last missing piece of the puzzle to leave us with a sweet taste. The most important thing though, was the fact that the positive energy that was obvious between the colleagues that worked as a team, was transmitted throughout the whole place and to us as well, making our stay more than pleasant. 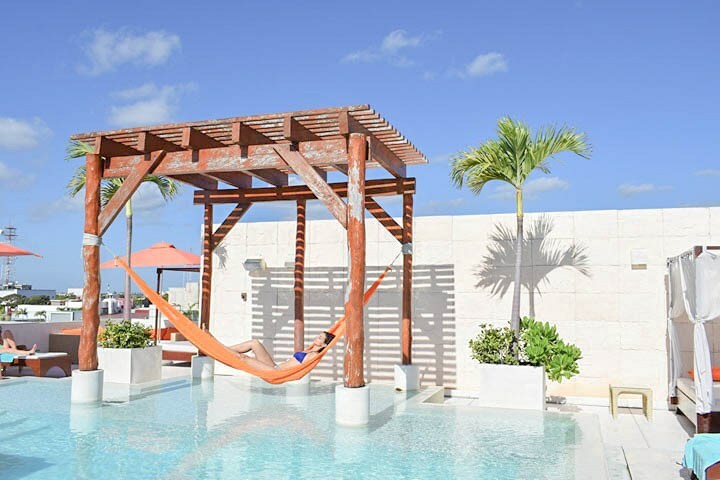 Taking into consideration all the services provided as well as the location, then, The Palm at Playa hotel would definitely be among the hotels that we would love to visit again! We were guests at The Palm at Playa and this is a review based on our personal opinion and experience. We want to thank the hotel and the personnel for the warm hospitality!